Professional Development, Inc., a local professional communication and professional development business, seeks to launch their new subdivision of online learning. Currently training takes place in the classroom. The online training initiative will be a hybrid of asynchronous e-learning and synchronous webinars. A research strategy will analyze current practices for transitioning classroom to online learning and to compare costs to ROI. An LMS or similar wrapper is needed to host the new course series. A technology selection analysis will be used to assist the client in choosing an LMS. In addition, further options for blended learning will be addressed. The project was framed in Google docs, forms and spreadsheets in order to get ballpark costs and organize research analysis outcomes. Professional Development, Inc. would like to convert their courses online so that they can expand their audience and increase the revenue in their business. Asynchronous Learning: Students may access the training as needed and may be more likely to select course offerings. Students that miss will have the option to make up the class with asynchronous learning. Courses will be accessible at any time of the day. Synchronous Learning: Live webinars allow the business to have a wider audience, where students can practice with real examples of participants’ conversations simultaneously over the internet. It is expected that the business will receive additional revenues. Asynchronous Learning: Students will be able to access Professional Development, Inc. video courses online. A library of skills has already been recorded. For example, if the learner chooses to review specific skills before critical business meetings, they may access the lessons at their convenience. Synchronous Learning: Live webinars can attract a wider audience not limited to the greater central Pennsylvania area. In addition, webinars can be recorded and placed into an LMS so that students can review what they learned at any time. As live webinar presentations become more mainstreamed in business, participants will have more options to apply their new skills in a variety of platforms. Instructors and peers can assist participants as they evaluate and provide feedback of how their communication styles come across media technology. Students will appreciate the values and interests of their audience from the client’s perspective. Participants will practice using the latest in webinar communication etiquette such as polling, raising hands, chatting, forums and emails. Professional Development, Inc. instructors will expand these activities while they build upon these exercises with style, content, and delivery of their verbal presentations. A blended approach allows webinars to take place during regular courses. A producer runs the webinar and assists the online audience during the live course. The online expansion will allow students to further examine communication habits. Learners will break down and strengthen crucial communication elements in a broader setting. Students learn to adjust their personal style of communication by participating in a series of like courses through webinars, classroom and asynchronous learning, skills will be reinforced. Most of the learners will be in the sales or business management fields. Age ranges are anticipated to be consistent with the work force with a wide range of technology skills. Time and expenses related to the purchase of a functioning LMS and web conferencing host will need to be sorted out prior to the project. The instructional designer will provide some guidance to the selection of these platforms but ultimately, the client must make the final purchasing decision. The instructional designer will work on this project on a part time basis. (A Gantt chart will be created after technology selection). The client is ultimately responsible to provide an LMS or similar platform for the instructional designer to work on at his expense. The client shall provide a web conferencing host for the webinar courses at his expense. All additional maintenance and expenses related to platforms and upkeep are the responsibility of the client. An embedded questionnaire was sent to vendors selected to contact for an RFI. 30 vendors responded. Professional Development, Inc. seeks to improve communication skills in individuals and organizations by receiving the benefit of an ideal development environment – fun, interactive sessions that focus on the most powerful tools and techniques. Improve communication skills by experimenting in a safe and risk-free environment. Professional Development, Inc. business is founded on a “Classroom” concept. “Workouts” are designed for ‘delivering confidence through competence’ by drill and practice. Members are able to try new methods, styles and techniques where feedback can be provided. Online learning provides greater flexibility and increased potential for revenue. By expanding into online learning, students will be able to access and review courses through the internet. Webinars provide additional opportunities to expand the audience beyond the parameters of the Harrisburg Metropolitan area. A Request for Information was created after the initial e-mail inquiries in the form of an embeddable survey. This was sent to over 100 LMS vendors. The survey had 32 responses and several vendors responded to the e-mail but declined to participate in the survey for various reasons. Based on the e-mail responses, it appeared that some of the LMS vendors preferred to receive a more formal Request for Proposal (RFP) from their potential customers to bid on. The survey was helpful in that it confirmed the initial selection as to be in alignment with the needs and wants of the client. Price breakdowns were varied per business model and the survey uncovered some creative ways for LMS companies to charge customers for additional services. The survey allowed scoring of specific features to be more accurate and made the phone calls to the sales representatives go more smoothly. Product websites were researched and reviewed for several LMS companies including those on the final list. Some of the LMS companies that were reviewed offered free trials. The free trials were used as a sandbox to experiment with navigational features. Most of the companies were contacted and interviewed by telephone in the final round. Gaps of information were covered and price structures were verified. Only one LMS was selected for a live virtual demonstration. efront was chosen because of the high score that it received and its remote location in Grease. A second demonstration is available upon request. Vendors from the final LMS list are eager to demonstrate their products at the client’s convenience! A LMS Decision Selection Analysis was created to rate the features and costs of the following selected LMS systems. The rating criteria were based on the needs and wants of the client. The following scores are based on the combined costs and features and ranked accordingly. It is recommended to schedule demonstrations for each LMS moving forward. A Return for Proposal should be created to start the bidding process. The formal RFP would allow the client to state their maximum budget. The client should plan for a $300 – $500/mo budget with initial bidding around or under $300/month. If the $300/month bid does not produce favorable results, a new bid can be submitted. The instructional technologist would like to create the RFP for the client as the next step in the process and schedule the first round of LMS demonstrations. How many hours from the development team will be put in the project? Discussion with Harrisburg University about using Adobe Connect as a platform for webinars. Fugu (Gracie University) was the comparable LMS selected due to its slick interface design, usability and client likability. Fugu was contacted about its services as a potential LMS. Unfortunately the business model would not fit well with Professional Development, Inc. and the price would be too costly to make it worth it. Fugu wanted to retain its branding and receive 35 percent of all revenues. Fugu would be unable to serve blended learning management for the classroom side of Professional Development, Inc.. Considerations should be made to keep the interface more intuitive. Currently in the classroom, Professional Development, Inc. curriculum takes participants through four levels of competency. New skills are tested as students learn the fundamentals of each level. As participants progress through the various levels and display competence, they receive insignia pins to indicate their new level. (Insignia pins are similar to that in martial arts and coded sequentially in white, yellow, blue, silver, and black.) This process allows participants to move at their pace. The interface design should correspond to the classroom competency levels so that participants that utilize both classroom and online learning can more easily navigate through the interface. Uniformity should be a consideration to align the new online learning with the classroom and business model. Business coaching and programs are set to 90 minute classroom workouts. Current classroom membership allows you to attend up to two communication “workouts” per week. Online courses should be designed to correspond with classroom courses for uniformity. An interface should allow users to access free and member based videos; these can be the video shorts that were already created on ‘You Tube.’ Members can access two live or recorded webinars per week. Additional courses should be extra. Each Communication Competency Module (CCM) is 8 hours of coached sessions scheduled to meet the needs of individual companies. Professional Development, Inc. can up sell corporate packages. Companies can have their sessions recorded by webinar and presented as a live blended option accessible later as an asynchronous learning CD or hosted on the LMS for a specific time period. Sessions can be produced on or off site. Currently the optimum classroom format is four two-hour sessions spaced one or two weeks apart. Five basic CCM’s are available and custom courses can be designed for an additional fee. The ideal LMS will be one that Professional Development, Inc. will be able to easily maintain without hiring a developer. Videos should be easy to upload and maintain. The LMS should have a shopping cart feature, utilize assessments and generate scores. Maintenance and bandwidth will need to be analyzed further. Plug-ins such as captivate should be compatible with the LMS. Webinars that can automatically be loaded would be a bonus. An LMS should be considered for a small business budget. Here is an interactive course outline that created to help me frame projects and add learning objectives quickly. 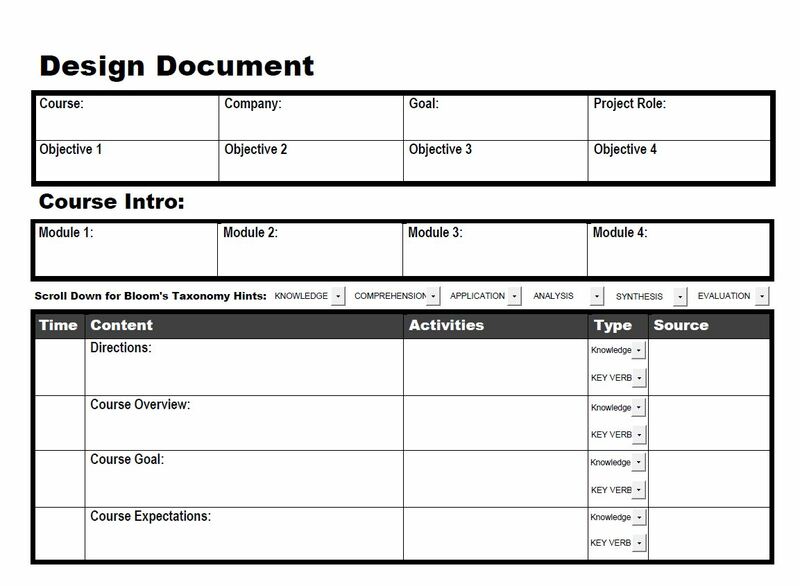 I added drop boxes to a four page interactive design document template. The design doc now conveniently lists verbs from Blooms Taxonomy! I am always looking for instructional design tools that will open up creative channels. I have a few more designs in mind, so, keep checking back in the future! In the meantime if you have any feedback or links to share feel free to make a comment or email me at arupert88@gmail.com. Interactive Design Doc by Angela Rupert is licensed under a Creative Commons Attribution-ShareAlike 3.0 Unported License. Permissions beyond the scope of this license may be available at arupert88@gmail.com. Have you wondered how others are billing their customers for instructional design services? I use a coding system based on the ADDIE model. This is a great way to keep track of all of the time that you spend in each of the categories. Notice the billing codes that I use and how the services are broke down into each billing section. The invoice that follows demonstrates how the billing codes look on a customer bill. Customers appreciate that I take the time to do this for them so that they know where their money is being spent. Also notice that I give each invoice a billing number because a lot of purchasing systems need that to automatically process the billing. I use a the year, the month and the day and two digits after the day to keep my numbers separated if I am billing multiple customers on the same day. I usually send out my billing invoices once a month. Earlier this year, researchers behind a study in Archives of Neurology say they had a found a link between brain-stimulating activities and levels of protein thought to cause Alzheimer’s disease. Showcased in this presentation are the results of two previous studies that seem to link an increase in cognitive processing with brain-stimulating activities as well. The following presentation walks the learner through a better understanding of the physical systems in the brain that are most affected by learning. Associated with each system is a glimpse of the games that were developed by educational game designers to stimulate brain activity. Towards the end of the presentation, there is a surprise twist! It turns out that there may be a more effective and even simpler way to increase cognitive processing. Can you guess what it is? 1. Demonstrate competence in visual learning design. The following PPT I had originally created for visual learning. The challenge was to create a visual learning experience with minimal text. The visuals are supposed to tell the story. Due to the complicity of the subject, however, I did add a small amount of text in a couple of places for this slide show presentation. To access the script relating to the presentation, visit my post at Slideshare. 2. Provide interesting and relevant content in my field of expertise. My interest in brain games goes way back. A few years ago, I had purchased Brainware Safari for my boys when they were in the primary grades. I noticed improvement in their learning and I wanted to find out more about related neuroplasticity research, the core idea surrounding brain games. A portion of neuroplasticity refers to the susceptibility of neural processes due to changes in behavior. Neurons have the tendency to rewire themselves to accommodate changes in the environment and to what extent these changes effect brain processes is still hotly debated. High profile systems such as memory, processing speed, attention, logic and multi-tasking are at the center of brain game design. Game makers theorize that that we can strengthen neural connections by engaging in activities that stimulate brain systems. 3. Demonstrate Slide Share embedded feature in WordPress. – I updated the color scheme and re-purposed it for slide share. The interactivity of the original ppt was disabled automatically so I removed the buttons as well. I noticed that the some of the effects from ppt did not carry over into slideshare very well, such as some of the photo formatting special effects features, I had to change the graphics. – I generated an embed code on Slide Share for WordPress. Slide share has an embed short link specifically for WordPress which made it quite seamless. From a graduate level Learning Technologies course at Harrisburg University, in Central PA. The course was called: Managing Technology Resources, and has been immensely helpful in the world of corporate learning and project management. SMARTest Consulting was the final e-learning Presentation on a Collaborative Project Management three students in the course. The ppt was re-purposed on prezi using a non-linear, sequential design inspired by my visual learning course at Harrisburg University. The web was created on a ppt using freehand shape tools and saved as a PING. The web was transferred as an image and saved in the background. The following is an example of a professional course evaluation report for a major corporation. A fictitious storyline was created to better illustrate the example. A course evaluation report is a tool often used to justify funding for training by human resource executives. Hart Industries seeks to evaluate hard data on training outcomes in order to eliminate unnecessary programs and to improve the value of those that remain. The human resource department of Hart industries has earmarked $30,000 of their budget to outsource a private consultation firm for assessment analysis of their training departments. Meeting Technologies training has been identified for the initial evaluation process as the software purchase was recently approved by the board. The following assessment strategy outlines the systematic breakdown of level 1 through 4 analyses. Program costs are estimated to run $211,850 for the Meeting Technologies training of 1000 staff. The return on investment of the Meeting Technologies training programs will equal $1,865,150 over a twelve month period, an 880% increase. Staff performance skills are estimated to be improved by 5%. Initial data will informally be posted on a written report after level three assessments. Findings will be evaluated and presented to the board two weeks after the level four assessments (approximately 15 weeks after training). After one year findings will be analyzed once again. Hart Industries is a mid-sized manufacturing firm with 30,000 employees. Two US assembly locations are on the East Coast. Two international manufacturing locations are in India and Mexico. Hart human resources department, in collaboration with the consultation firm, has determined that analysis of one program at this time, will pilot custom assessment methods for future training. 1. Measurable objectives for course training will be identified. A six hour training class is scheduled for a pilot training group of ten participants. A control group of ten participants at Hart’s Florida location will not receive the training. All participants will take level one and level two assessments on the day of the training. The level one assessment is a brief evaluation of the training class, instructor, and overall feel from the course. The level two assessment measures content knowledge before and after the six hour course. Control groups will take the same tests on the same day, even though they will not receive the training. Due to time constraints, a level three test will be given six weeks after the course. Interviews with department supervisors and performance monitoring checklists will be used to analyze departmental improvement. Level four client surveys and telephone responses will be evaluated by the HR department. 2. Meeting technologies was prioritized to utilize the new meeting technologies system recently identified by the board. 3. A data collection plan for the program is attached in the next document. 4. A power point presentation will outline course assessment descriptions and consultation services in more detail. Subject matter experts and human resource representatives will collaborate with the assessment consultant to collect data for analysis at both properties. Quantitative data will be collected from the assessments and questionnaires and placed into a spread sheet. Qualitative responses will also be included in the pilot findings. Coaching for Business Impact, Stress Management and Meeting Technologies Training have been identified as top training priorities. It is the recommendation of the HR department and the private consultation firm to assess all future training programs in similar manner. Results will be used to eliminate unnecessary programs and to improve the value of those that remained.